Your guests might think they’re getting a strawberry cupcake, but they’re in for a surprise. This dessert is actually a meringue that has been sliced in half and filled with a strawberry-rhubarb filling. And it’s all topped with whipped cream and the top of the meringue. 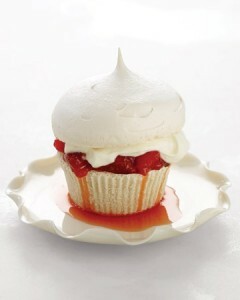 Strawberry desserts would be perfect for your summer wedding – they really are the perfect summer fruit. And these “cupcakes” would be a delicious surprise for your guests. You could even serve them as an alternative to your wedding cake. You can find these meringue cupcakes here.